France’s new season that would culminate with the Euros started in August with the traditional Gala Match for U.N.F.P. In contrast to the previous season, where France had played a National Team (Poland), they chose to revert to the tradition of playing club sides in an unofficial capacity and this time away from Paris at Toulouse. It was reported that Hidalgo had originally wanted Mexico, but there were scheduling conflicts. The chosen opponent were Uruguayan side Peñarol Montevideo, the Copa Libertadores and Intercontinental Cup defending Champions. Just like he had stressed after the match vs. Belgium, Hidalgo insisted that the experimentation phase was over and there would be few newcomers from that point on. He did however; include one newcomer that would have a profound effect. For the goalkeeper position, he opted for Joel Bats of Auxerre. He was the fourth man to be tried since the World Cup (Ettori, Castaneda, Tempet). During the offseason many of Hidalgo’s Internationals had changed clubs. 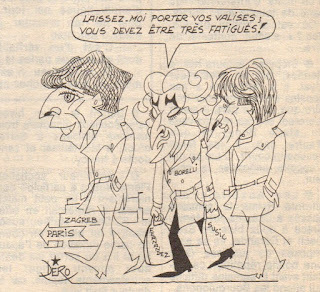 Le Roux, Genghini and Daniel Bravo had joined AS Monaco, while Battiston and Tusseau had joined Bordeaux. Yannick Stopyra felt that leaving the comfort of Sochaux and joining Rennes would be a good challenge for his prospects. Once again Platini would be absent due to Coppa Italia commitments with Juventus. Marius Tresor would once again be absent as well. Bats started in goal, Hidalgo stuck with his set defensive formation of Amoros, Battiston as outside backs and Bossis and Le Roux in the center of defense. 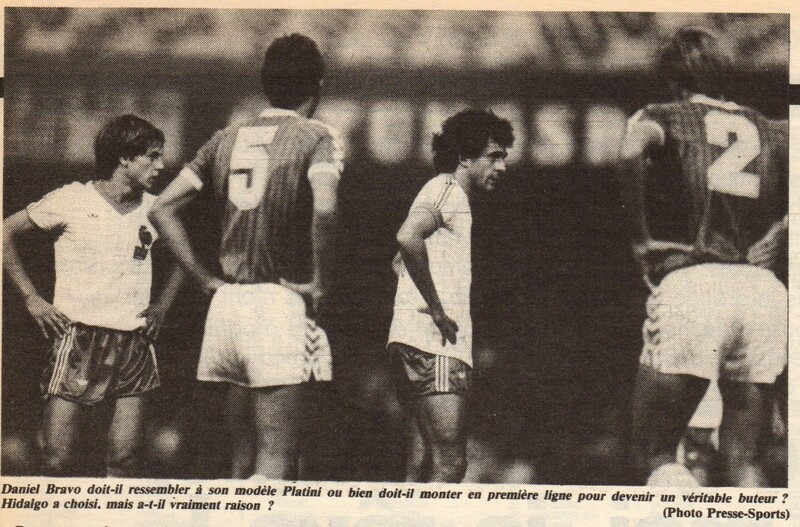 Alain Giresse, Tigana and Fernandez took their customary spots with Ferreri deputizing for Platini. Hidalgo chose to experiment with Daniel Bravo in an unaccustomed position as the number nine. Ferreri scored France’s winner right at the start of the match. France dominated the match but were guilty of losing too many balls. Bravo, in particular, missed many chances and the experiment of using him, as the center forward clearly did not work. Bats in his (unofficial) debut had little work to do. He stopped three shots in the entire match (the first in the 55th minute). It had not been a vintage performance by France, but it was an improvement from the previous year’s debacle. 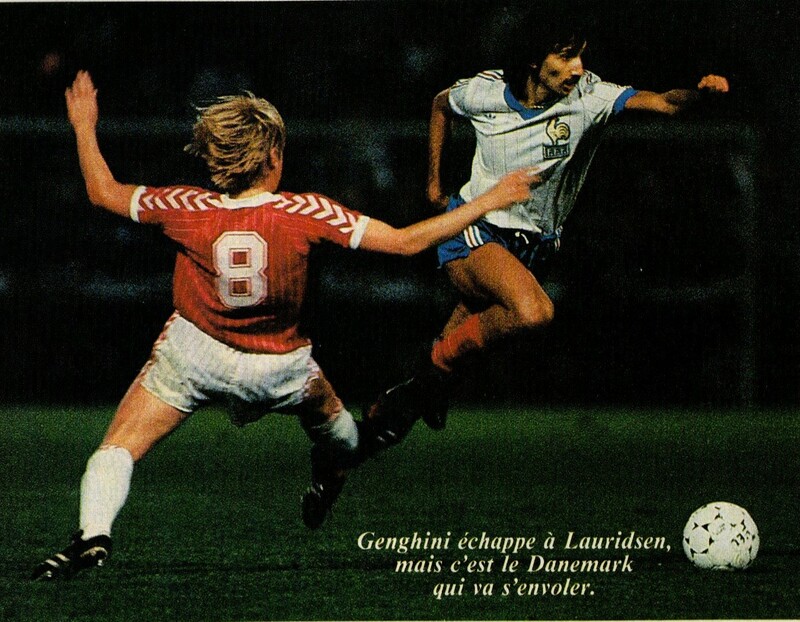 France’s first official friendly of this important season was against Denmark at Copenhagen. A year ago a match against Denmark would not have appeared a daunting task, but they had improved to such an extent that they were on verge of qualifying for the Finals of the Euros at the expense of England. 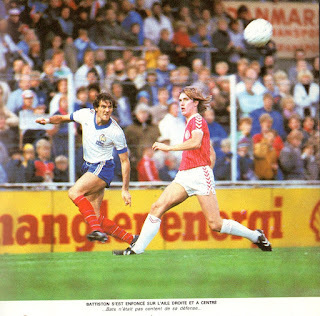 It was the greatest Danish team in History led by the veteran Allan Simonsen that would be known as ‘Danish Dynamite’ in the coming years. England Manager Bobby Robson would be in the stands to observe his opponents that he would face in a couple of weeks (Denmark would win 1-0 at Wembley). The Danes were missing a couple of regulars for this match. 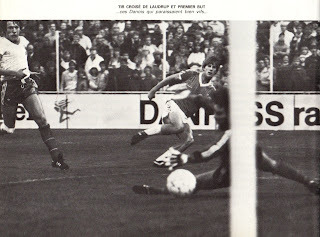 Jesper Olsen was out, along with the Anderlecht duo of Morten Olsen and Frank Arnesen. 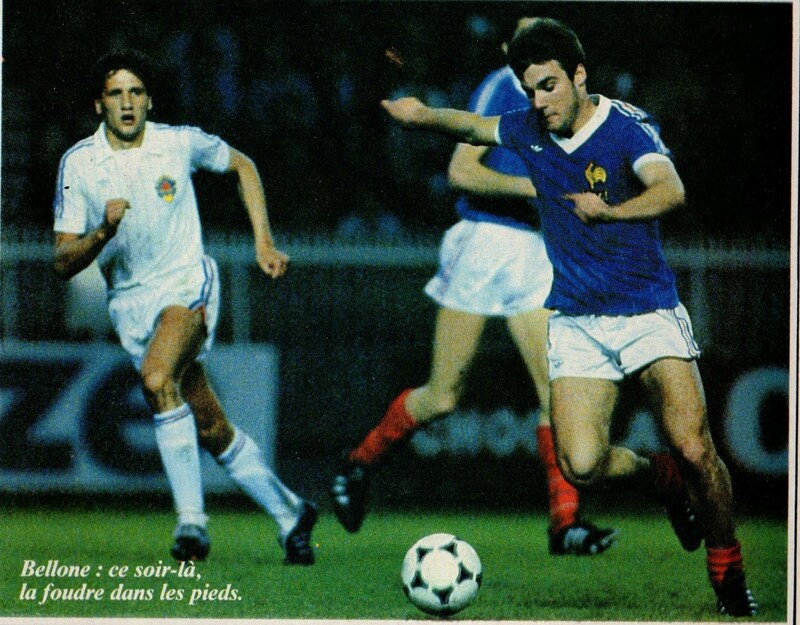 For France, Platini was back for the first time since the previous March (vs. USSR 1-1). Tresor was once again unavailable as was Thierry Tusseau. Bruno Bellone and Jean-Marc Ferreri were retained with the Under-21 squad for their qualifier vs. Sweden. 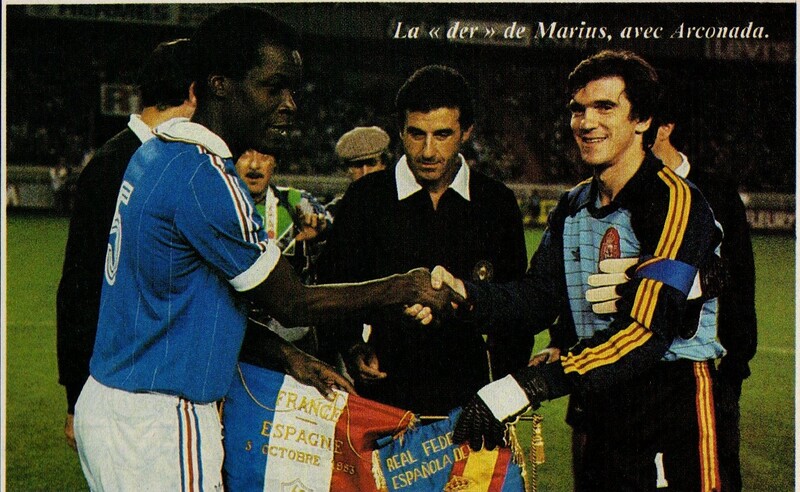 Joel Bats made his Official debut for France in the goal. Hidalgo stuck with Amoros, Battiston (as right back this time), Le Roux and Bossis in defense. Hidalgo was unable to select his ‘Carré Magique’ as Tigana was out through illness. Therefore Bernard Genghini was selected to partner Platini, Giresse and Fernandez in midfield. In a 4-4-2 formation with no wingers, Bravo and Rocheteau were upfront. 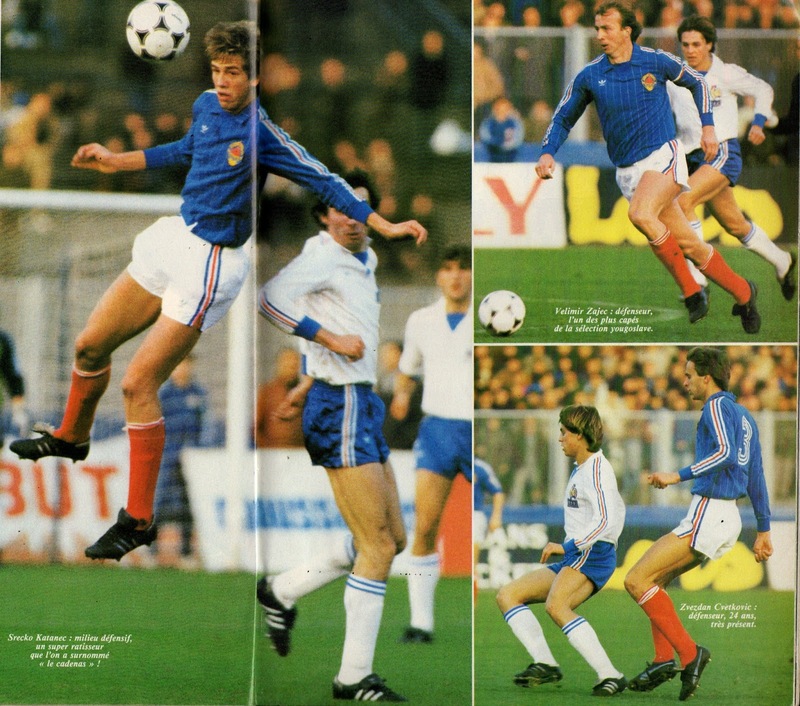 This match would turn out to be a wake up call for France, who until then had appeared to be in a very good position to win the Euros after impressing in the previous friendlies. 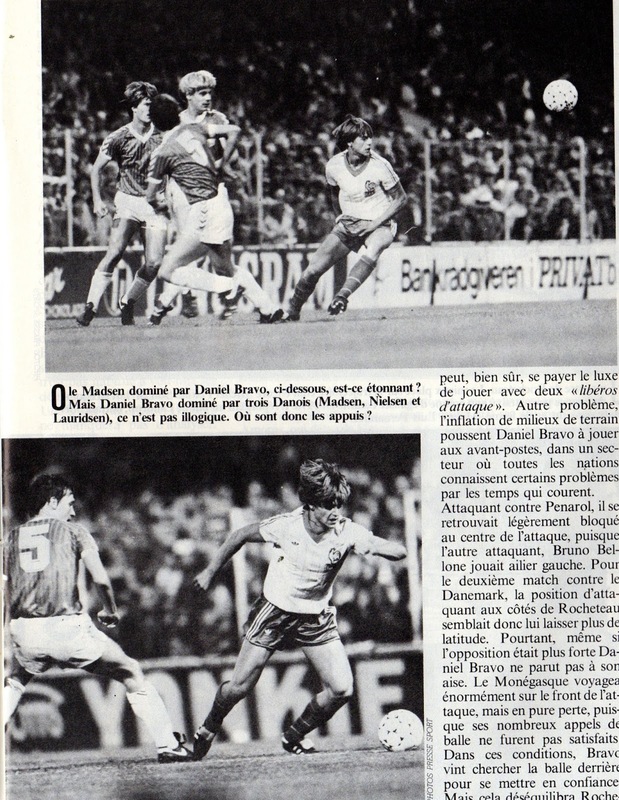 Young Danish sensation Michael Laudrup gave the hosts the lead in the 20th minute, before Platini tied the match minutes later (26th minute). For the second half, Simonsen was moved to the right side and was instrumental in Denmark’s go ahead goal in the 59th minute from Keneth Brylle (though the goal was clearly offiside). Michael Laudrup killed off the game with Denmark’s third (75th minute). France were generally good in midfield but poor in defense. Platini stated, “ it’s a match that we could have won but we lost “. The Bossis-Le Roux central defensive partnership was put to the test like never before. Hidalgo even hinted that Tresor should return in which case Bossis could play stopper. Bossis responded that they should look at his whole history with the National Team and not just one match to make a judgement. 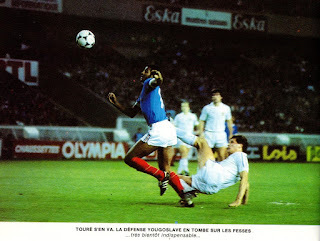 He added that he respected Tresor, but that even Tresor himself had played bad matches with France in the past. Hidalgo criticized Le Roux as well for going a lot to the wing to cover. In all Hidalgo described the match as “good lesson… ideal to face the future“. The striker position was still troublesome and Hidalgo stated, “if I had a great striker I would call up immeditaely“. Bravo had struggled once more as striker, but Hidalgo admitted that he was playing out of position from his club and added that Bravo was there to learn. 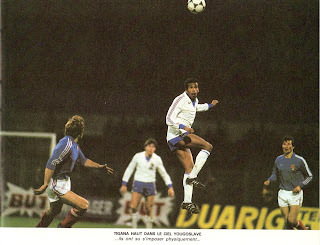 This would be France’s last defeat in an International match until May 2nd, 1985 when they lost (0-2) to Bulgaria in Sofia in a World Cup qualifier. Despite letting in three goals, Hidalgo had found in Bats the goalkeeper he was looking for and he was to be France’s starting goalkeeper into the end of the decade. Though he did not play, this would be the last time that Amisse was called up and he would disappear from contention. 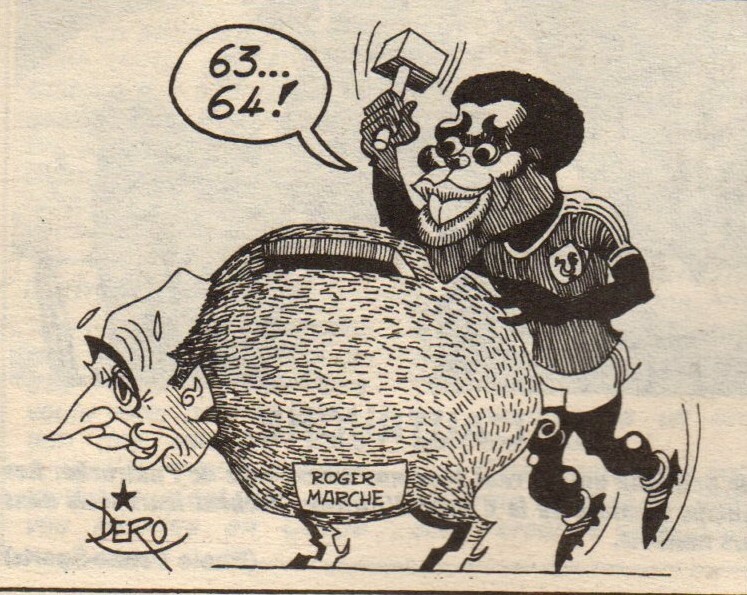 France’s next friendly vs. Spain in Paris, would forever be remembered as the match where Marius Tresor broke Roger Marche’s appearance record by earning his 64th cap. He captained the side for this momentous occasion. As always injuries forced Hidalgo to make modifications. Yvon Le Roux was the lone regular in defense partnering Tresor. 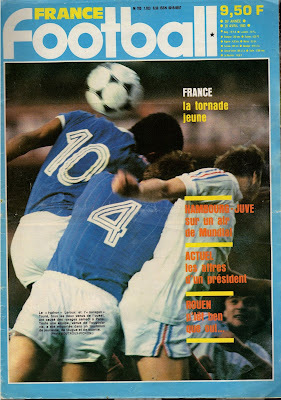 Amoros, Bossis, Battiston, Tusseau, Thouvenel were all injured or unavailable. Hidalgo was forced to call up uncapped Nantes pair of William Ayache and Michel Bibard, as well as St Etienne’s uncapped defender Jean-Louis Zanon. Many believed Bossis had made himself unavailable becuase he wanted to play as Libero and with Tresor that would not be possible. Hidalgo denied this claim. In addition, Giresse, Bravo and Toure were also unavailable. Genghini was called up in haste to cover the withdrawals in midfield. 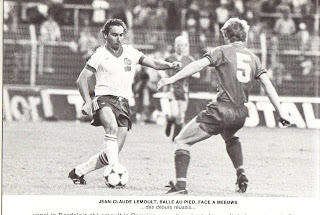 Jean-Claude Lemoult also received a rare call-up perhaps as a result. Alain Couriol received a recall after almost a year away. France played a 4-4-2 formation. The defense was inexperienced save Tresor. Ayache and Zanon were earning their first caps; Le Roux was only earning his third, while Joel Bats in the net was also playing in his second Official match. Paris St Germain pair Fernandez and Lemoult were the two defensive midfielders with Platini in the center and Ferreri on the right wing. 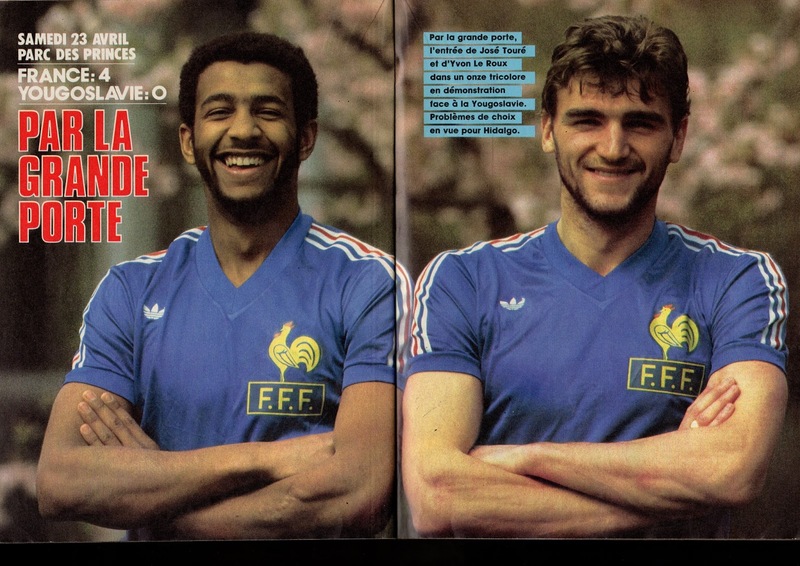 Rocheteau and Bellone were upfront. 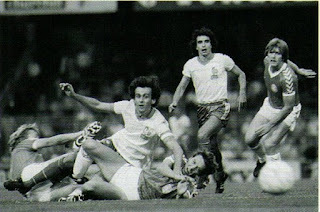 This was match was played shortly after Spain and Athletic Bilbao defender Andoni Goikoetxea had severely injured Diego Maradona in League play. His participation had been criticized as a result. The player nicknamed “the butcher of Bilbao” was suspended in the League but not from the National Team. There were fears that Spain would be overly physical, but these fears turned out to be unjustified. 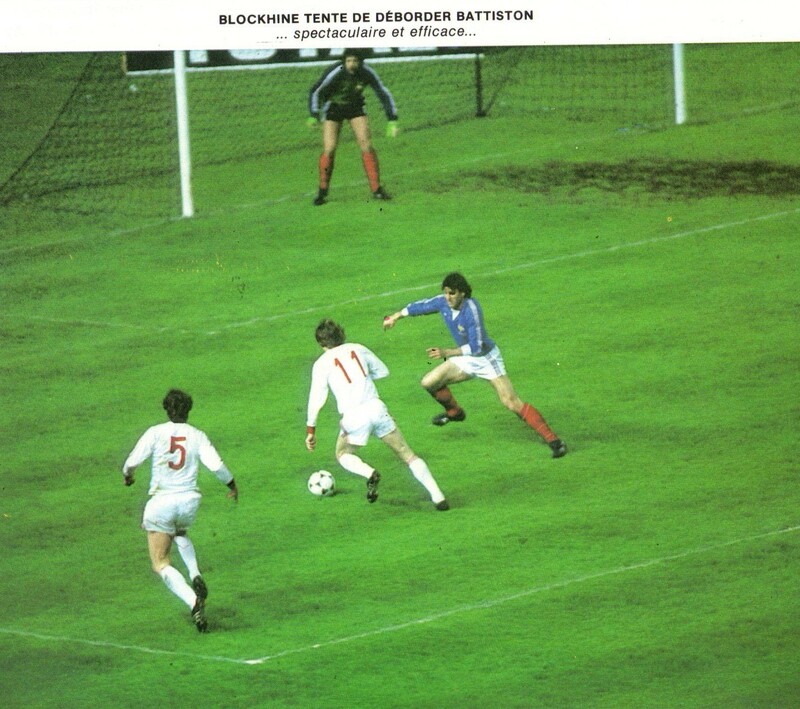 France would take the lead in the 60th minute through Rocheteau. 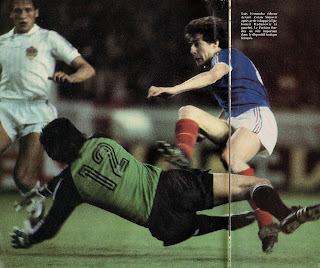 It seemed France were headed for a victory when in the 83rd minute, Bats fouled Juan Señor in the box. Señor himself scored from the spot. 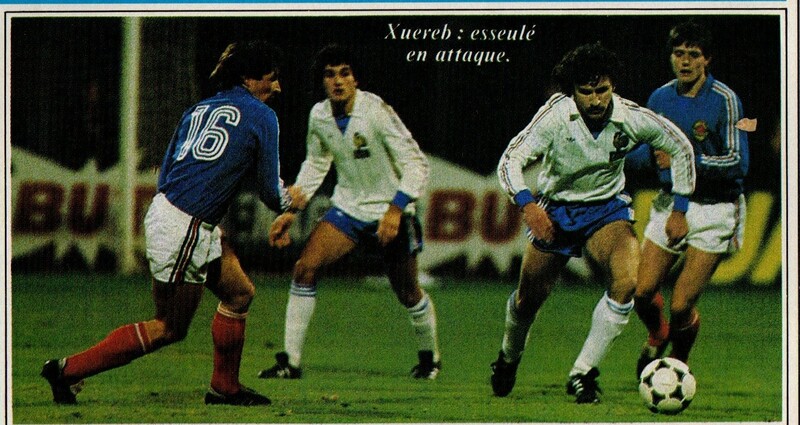 As far as the French Press, the team had played badly except for Rocheteau. Hidalgo disagreed; his only regret was in not winning. He praised his players’ engagement in the match. He said, “I find the Press excessively severe. I personally saw an intense match due to its tension and engagement”. Some also criticized him for offering a “gift’ to the 34 year old Tresor in selecting in his record breaking match. Due to the key absences it would be to hard to assess France’s performance. Incidentally, Spain would also be their opponent in the Final match of the Euros in the summer (….that is another story). Alain Couriol came on in the last five minutes and played his last ever match for France as he also disappeared from contention. Likewise, Tempet was called up for the last time and would not be recalled again. Hidalgo appeared satisfied with his starter (Bats), but would have to search for suitable backup in the net. Lemoult and Ayache played their last matches under Hidalgo and were left at the disposal of the Olympics squad, along with the non-playing substitute Bibard. France’s last friendly of 1983 was against Yugoslavia at Zagreb, the opponent they had handily defeated back in April in Paris. This would of course be a different type of encounter as the match was on away soil and the Yugoslavian squad would be stronger and more experienced as they were in their final phase of qualifying for the Euros in their Group. Platini was injured and not released by Juventus, but Hidalgo did have Giresse back along with Tigana and Fernandez. Daniel Bravo was drafted to be in the midfield to make up the numbers as a false right wing, while Giresse took up the organizing duties. 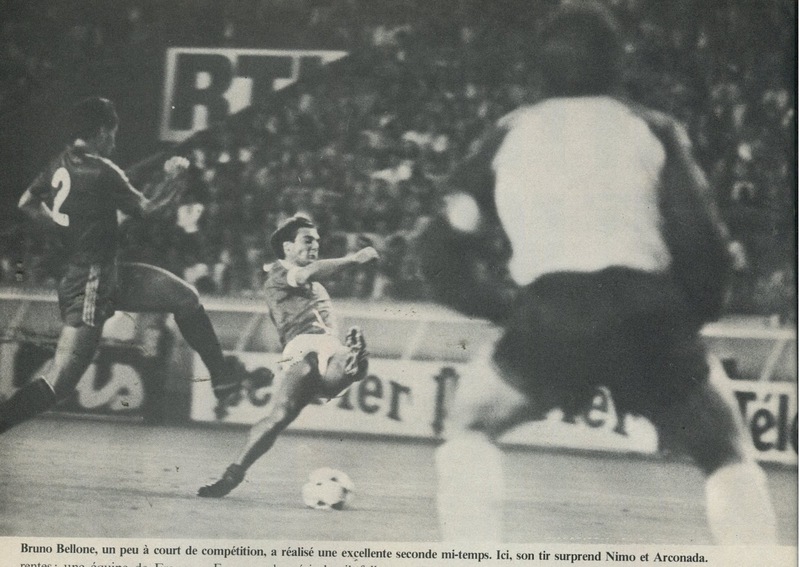 Tigana was tasked with marking Safet Susic. In a 4-4-2 formation, Marius Tresor was back as Libero once more (for the last time) with Le Roux as his partner in the center. This meant that Bossis would play as a right back for this match with Amoros on the opposite side. 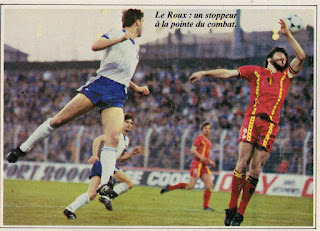 Bossis had been playing as Libero for club and country for eighteen months. 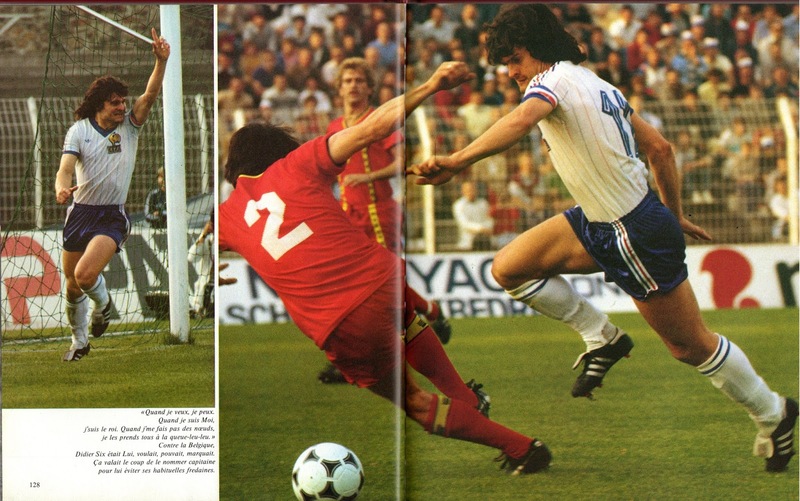 Upfront Bellone and Rocheteau were once again selected like the match. Hidalgo had recalled RC Lens’ Daniel Xuereb after many years away after his success with the Olympics squad (He would make an appearance in the second half). His Lens teammate Phillipe Vercruysse was also called up. France were better in the first half but could not break through a stiff defense. The match ended scoreless and perhaps the main satisfaction was the performance of the defense. Hidalgo expressed as much and praised the fact that they had kept a clean sheet away from home. Hidalgo had specially drilled into his defenders to hold onto the result. France had chances but could not take advantage as its strikers failed once more. Hidalgo would excuse this by saying that most of the French strikers have been injured recently, which had affected their form. 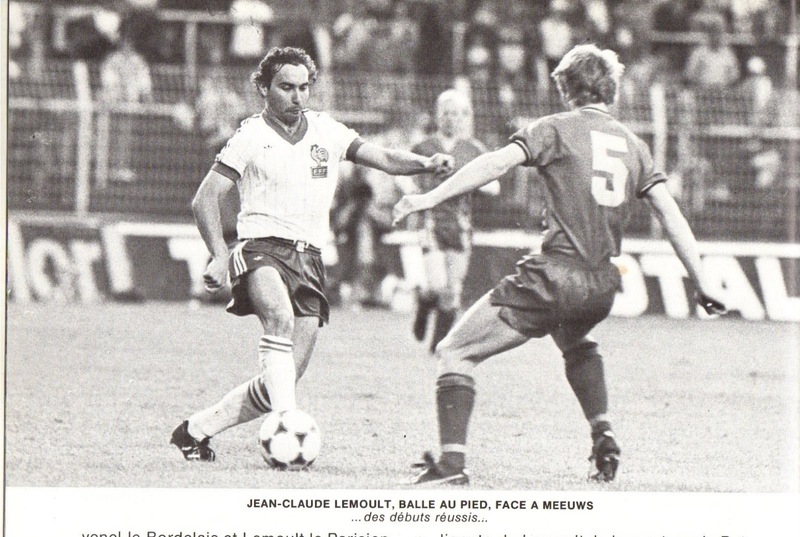 There was clamor to recall Bordeaux’s Bernard Lacombe, since most strikers were unable to impose themselves in the position. 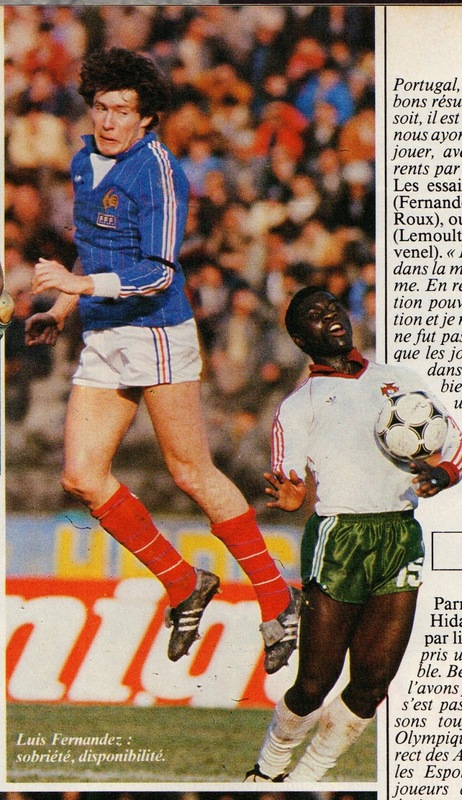 This would be Marius Tresor’s 65th and last match for France, as Hidalgo would decide that Bossis was a better option at Libero than the ageing Tresor. 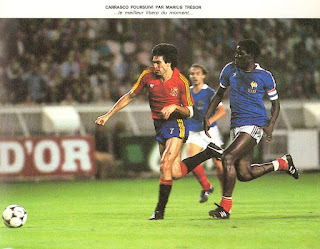 Marius Tresor would retire from the game at the end of that season. This was also the last time that Jean-Luc Ettori was called up by Hidalgo. Daniel Xuereb would also not be recalled again by Hidalgo, as he would stay with the Olympics squad. At end of year, the squad spent 12 days altitude training at Font-Romeu with wives and children present to get the players to bond. Paris St Germaoin defender Jean-Marc Pilorget was invited to this gathering as a future prospect, but would be the victim of a car accidnet around Christmas and would be out for nearly two seaons with his International future over. 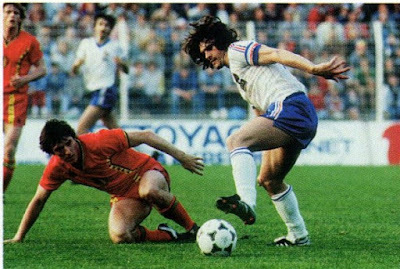 Other surprise invitees included Rene Girard (not selected since the World Cup), as well as his Bordeaux teammate Bernard Lacombe. 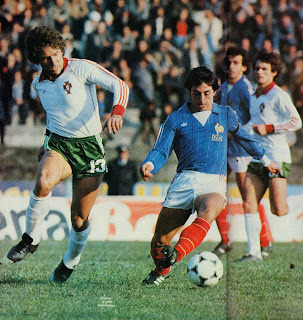 France’s first friendly of the new year (1983) was on away soil once again, this time at Portugal at Guimaraes. 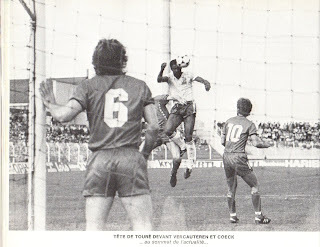 Marius Tresor and Alain Couriol were both out injured. Hidalgo confirmed Tempet as his current number one by starting him. Strasbourg goalkeeper Dominique Dropsy was recalled to act as cover (he had been out of favor since 1981). Nantes’ excellent season also earned a recall for winger Loic Amisse (his last cap was in 1980). Dominique Rocheteau was likewise recalled. 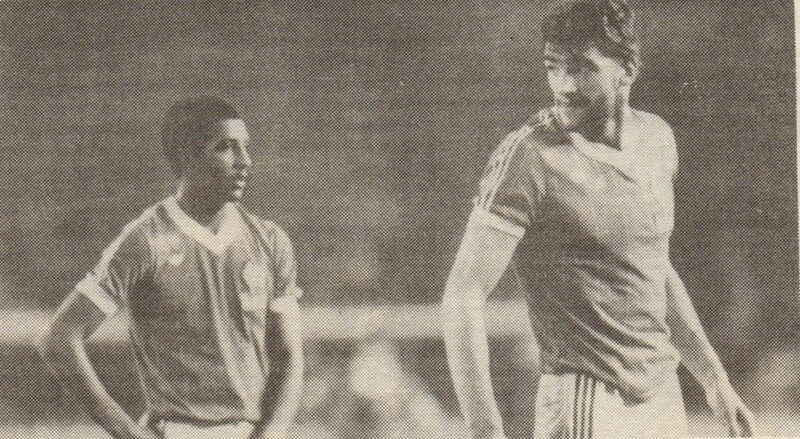 Marius Tresor’s injury allowed Hidalgo to install Maxime Bossis as Libero for the first time for the National Team and he would grab his opportunity to make Hidalgo question whether Tresor would be able to last until 1984. 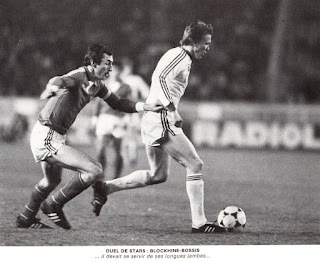 Bossis had been Nantes’ Libero since the start of the 1982/83 season to excellent effect (Nantes would be Champions that season). Mahut also earned a recall as stopper to partner Bossis in central defense, with Amoros and Battiston firmly established as the outside backs. 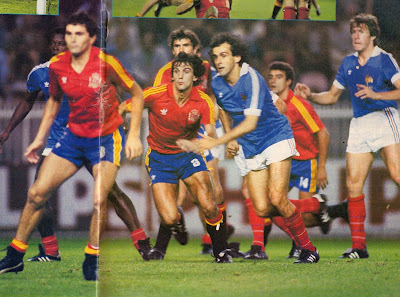 Platini, Giresse and now Fernandez started in midfield. 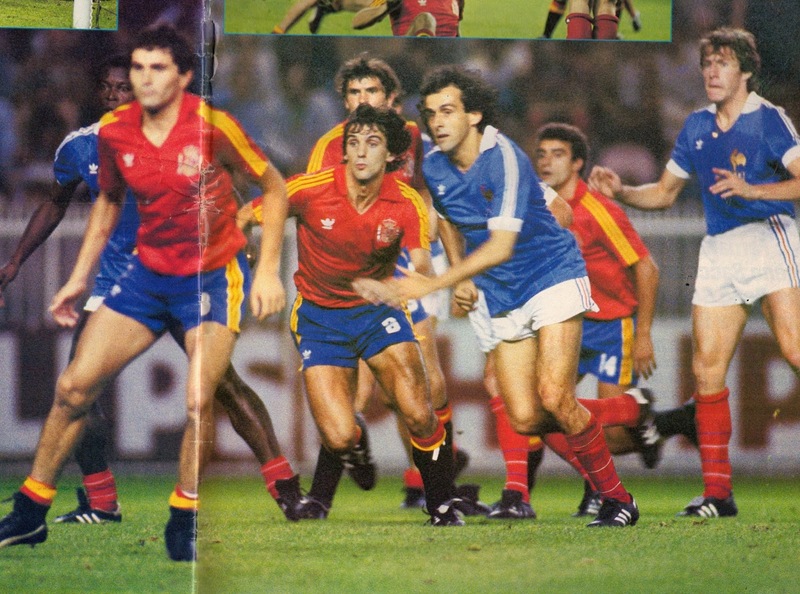 Hidalgo had to choose between Tigana and Fernandez. Tigana was ill, therefore Fernandez started, though Tigana would make an appearance as a substitute. Hidalgo chose a 4-3-3 formation, with Ferreri and Amisse as wingers and Stopyra as the new number nine. In the end it was a rather easy win against a disorganized Portuguese side lacking any cohesion. 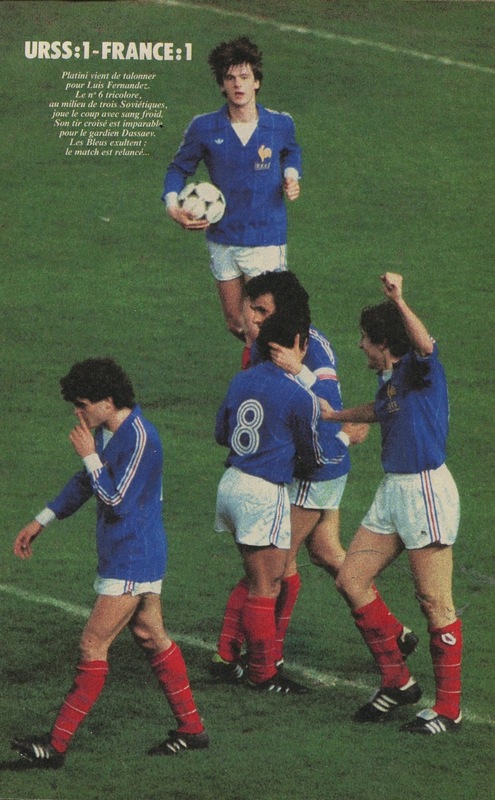 France were up (2-0) after eight minutes through goals by Stopyra and Ferreri (through passes from Platini). Stopyra scored another goal in the 70th minute. Hidalgo praised Bossis’ performance as Libero, as well as the integration of the young players. He said, “We could have been pre-occupied with Marius’ (Tresor) succession. After what Bossis just did, we have no such worries”. As far as the cohabitation of two new Liberos, he added, “in friendlies it is out of question for Tresor to be a substitute for official competition he could be on the bench”. 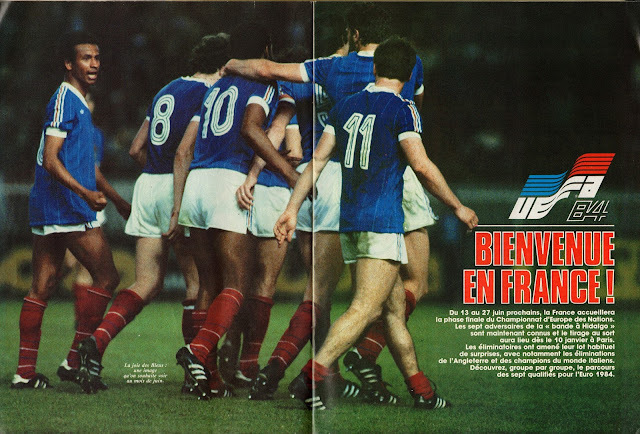 ‘L’Equipe’’s headline on February 17th, 1983 read “This France squad is calm just like Bossis”. Also to note, that the match took place just a few weeks after the death of Bastia and France midfielder (1978 World Cup veteran) Claude Papi, aged just 33, from an Aneurysm. 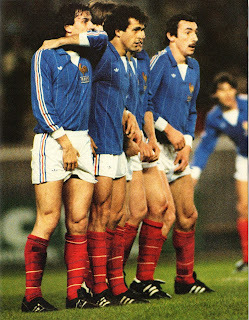 The French players wore black armbands in the match. 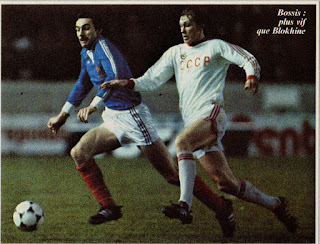 France’s next friendly was against the Soviet Union at Paris (in another un-televised match). Hidalgo kept faith with the same squad as the Portugal match. 15 out of the 16 players selected against Portugal were present for this match against a stronger opposition. The only change from previous squad against Portugal was Alain Couriol. He came on for Daniel Bravo, who was retained with the Under-21 squad. Bossis was once again installed as the Libero with Mahut as his partner. France employed a 4-3-3 formation once more with Ferreri and Amisse as wingers supporting Stopyra as the number nine. This was the first time that Hidalgo had selected the same squad two matches in a row. Prior to the match, there had been a lot of chatter about Alain Giresse’s future destination as many clubs were courting him. In the end he would re-sign with Bordeaux for three more years and apparently this lifted a huge weight from his shoulders and he was able to play more freely. 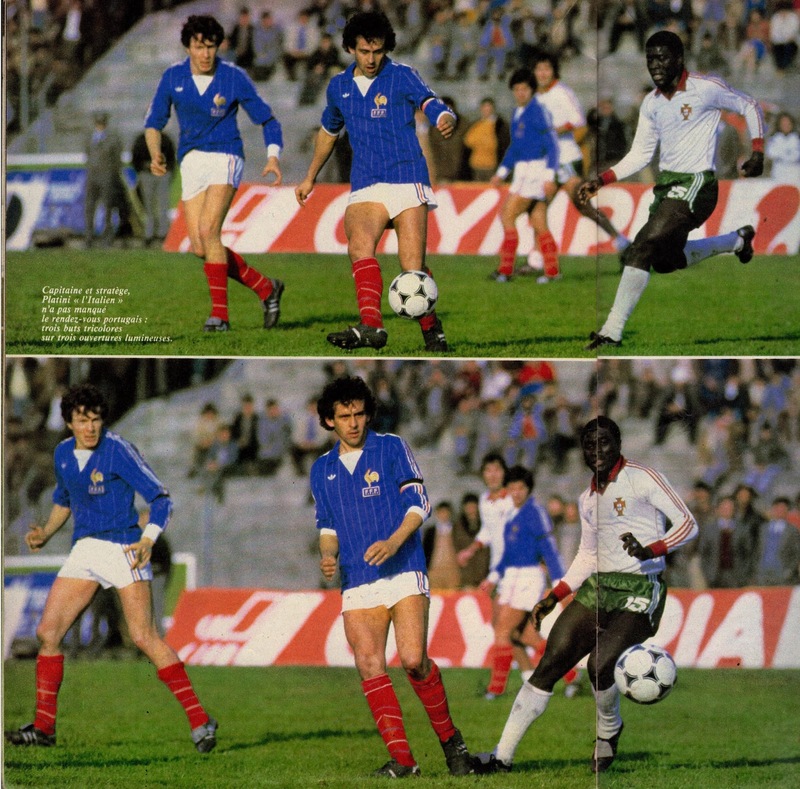 As a promise to Juventus, Michel Platini was to play one half only (Tigana would replace him in the second half). 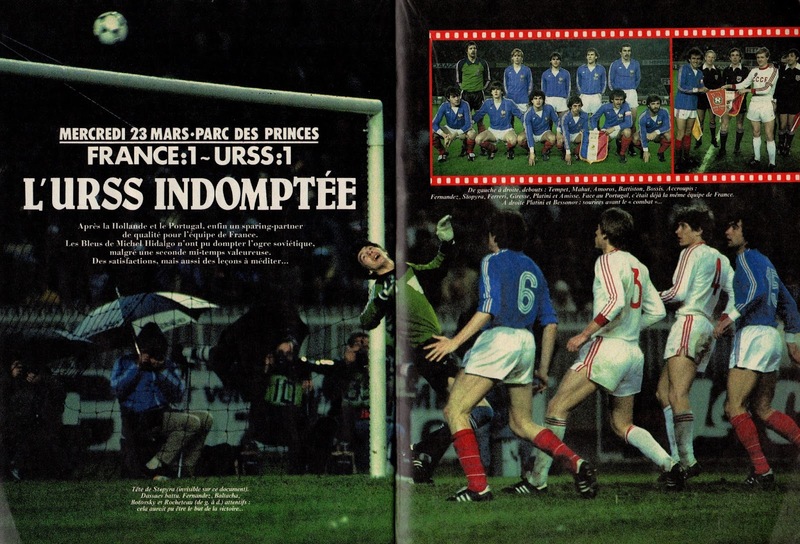 Attendance was satisfactory at Parc des Princes after low turnouts in two previous matches vs. Poland and Hungary. France played poorly in the first half, most notably Ferreri who struggled. The French lost too many balls and made many erroneous passes. The Soviets dominated the first twenty minutes. Blokhin scored a goal in the 27th minute that was ruled out due to offside and handball. It was no surprise when France fell behind to a Cherenkov goal in the 28th minute. Afterwards France pressured and Fernandez (playing his first match for France at his club’s home ground) scored after an assist from Platini. France took initiative in second half as the Soviets started to tire, though the score remained unchanged. France had faced their strongest test of the season (the Poland match could be written off as an anomaly). Phillipe Mahut played his last ever match for France as Hidalgo was unsatisfied with the position of Stopper. Dominique Dropsy was likewise never called up again by Hidalgo. This was Amisse’s last match for France; he would be called up once in the following season (though he would not play). 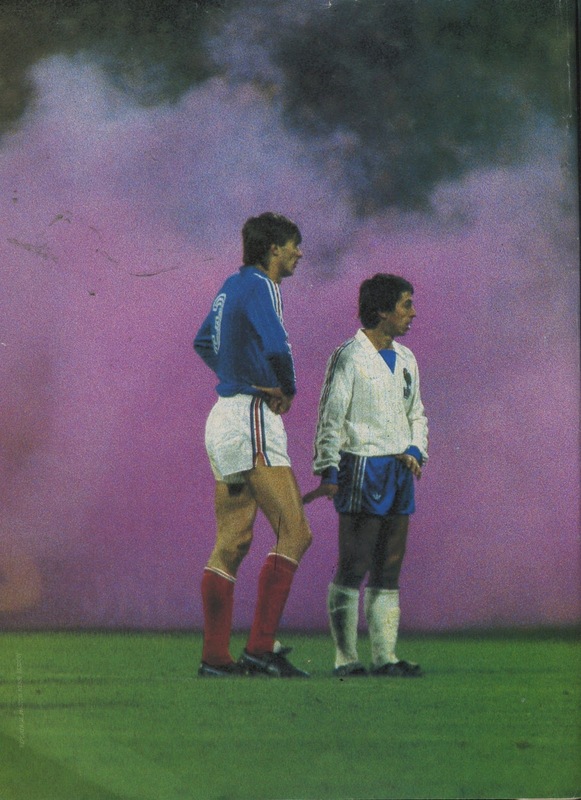 France’s next friendly was against Yugoslavia at Paris. Hidalgo would have to do without Platini who was retained with Juventus. 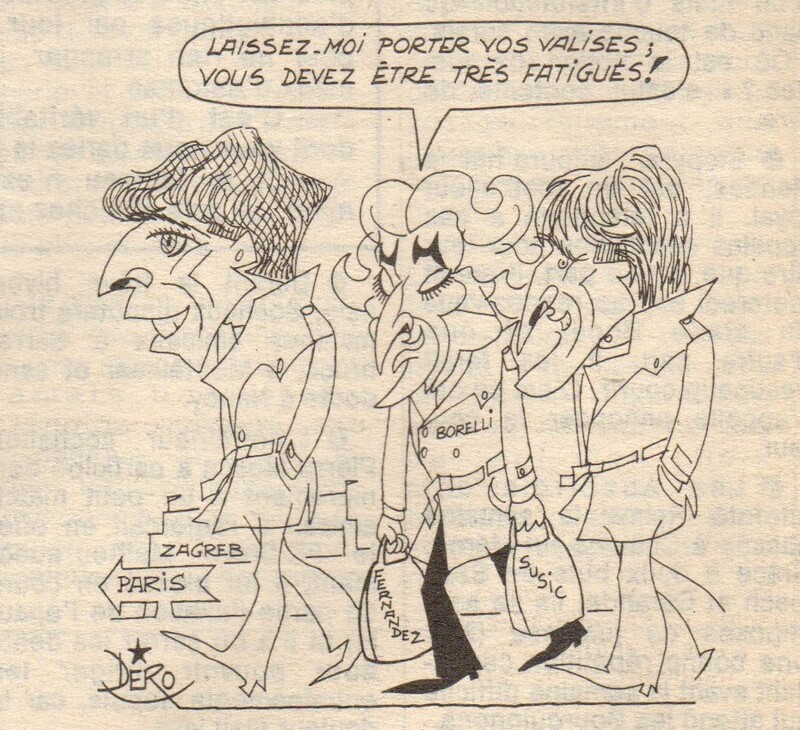 Battiston, Giresse, Amisse, as well as Tresor were also missing through injury. 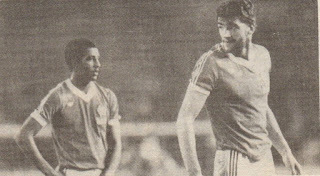 Thierry Tusseau would be called in to replace Battiston at the back. 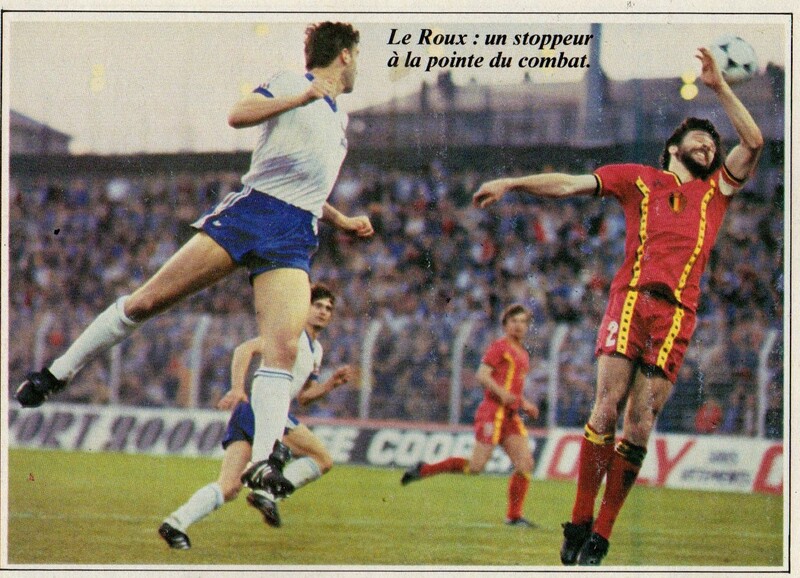 Bossis continued his run as Libero in Tresor’s absence. 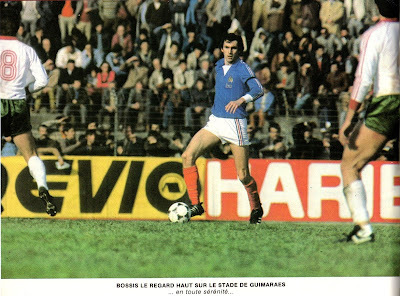 To partner him as Stopper in central defense, Hidalgo selected Brest’s uncapped tall defender Yvon Le Roux. 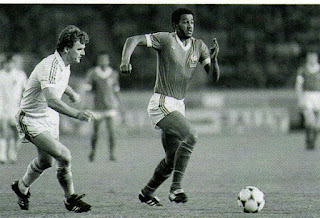 The other uncapped newcomer to the squad was Nantes’ talented Jose Toure, nicknamed ‘Le Bresilien’ (The Brazilian). The duo took their opportunity with delight and would both score in the match. Most notably, Le Roux established himself as the Stopper that Hidalgo was searching for. 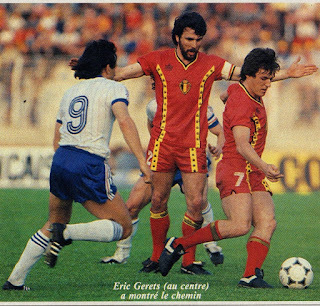 Other players who earned recalls after a time of absence included Bruno Bellone, Didier Six and Bernard Genghini Surprisingly; Jean-Luc Ettori was also called up as back-up goalkeeper. 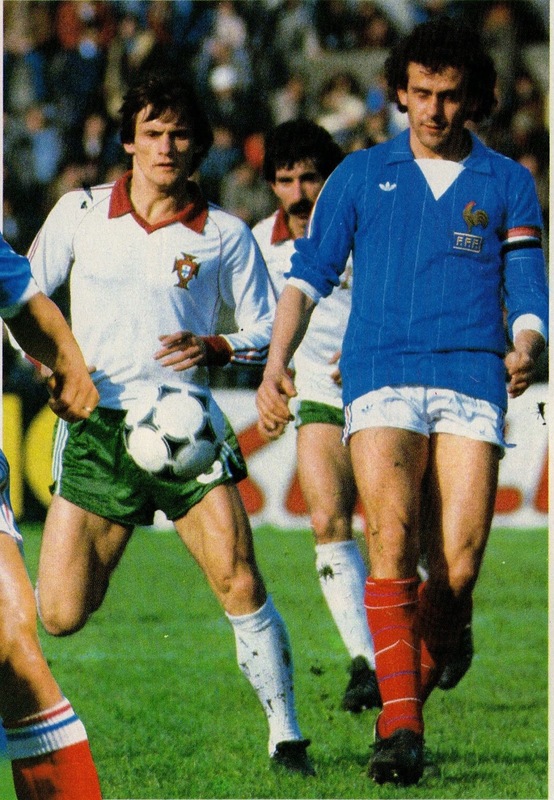 Young uncapped Nantes defender William Ayache would also be called up for defensive cover. 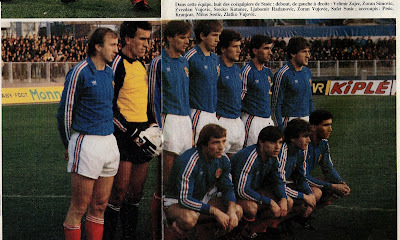 This was a weakened Yugoslavia side who were missing many of their stars; including Paris St Germain based Safet Susic, as well as Vladimir Petrovic (Arsenal). The likes of Zoran and Zlatko Vujovic, Jerolimov, Blaz Sliskovic, Nenad Stojkovic, Milos Sestic and Pasic were unavailable as they were doing their military service. Susic dismissed the current squad by saying “those in Paris, know just a year ago they weere not ready for the National Team and know they are not playing in the real National Team“. France played in a 4-3-3 formation with Tigana was the organizer in midfield. Ferreri was on the right wing and Toure was the center forward (though playing as number 10). 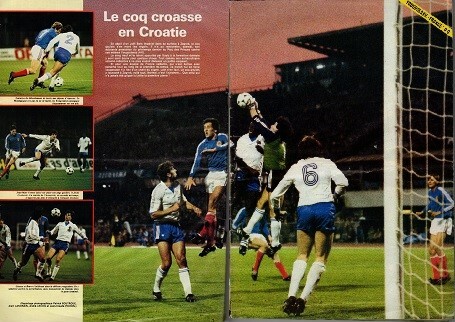 It was a match that France totally dominated against a weak inexperienced Yugoslavian side. Tempet was a virtual spectator as France did all the attacking. The debutant, Yvon Le Roux opened the scoring in the 22nd minute with a header. 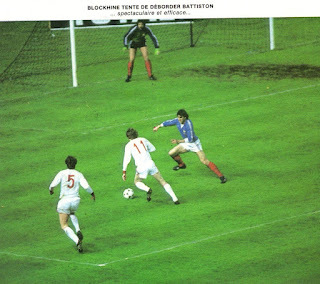 Dominique Rocheteau scored France’s second ten minutes later. 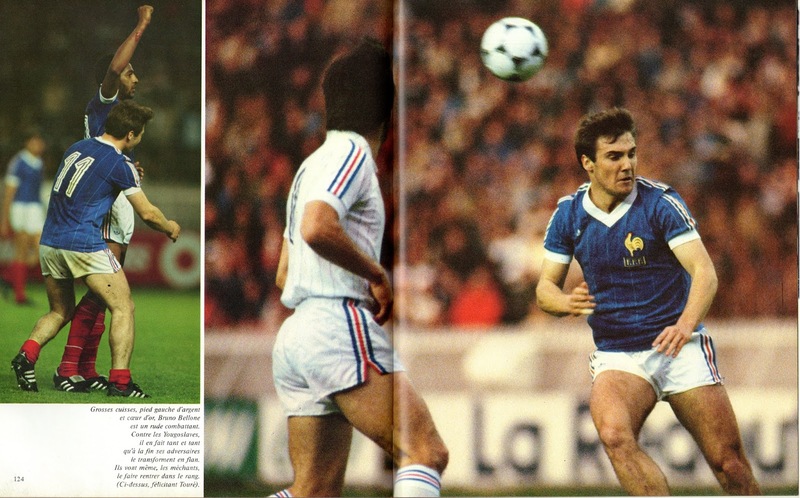 He scored France’s third just after the break from an indirect free kick. The other debutant Jose Touré rounded out the scoring with a brilliant volley in the 74th minute. Bellone had done so well that even Hidalgo expressed his surprise. Hidalgo once again praised the input of the youth and how they had taken their opportunity (Le Roux and Toure). Hidalgo liked that the Group was becoming larger. 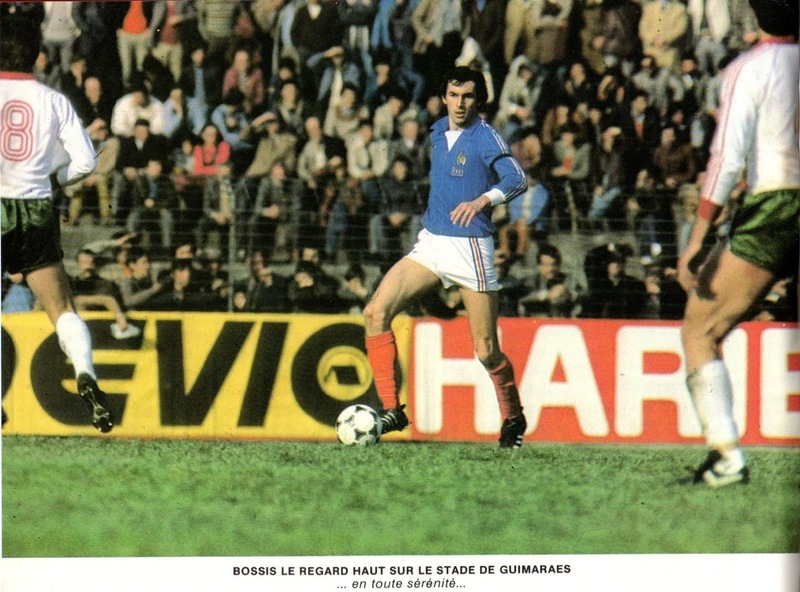 Bossis underlined the “excellent atmosphere with the ‘Les Bleues’ (the blues)“. Le Roux would become France’s Stopper that day as the Mahut experiment was over and Christian Lopez was out of reckoning. (Le Roux would also earn a transfer to AS Monaco in the offseason). Yugoslavia Manager Todor Veselinovic declared France as the next Euro Champions. 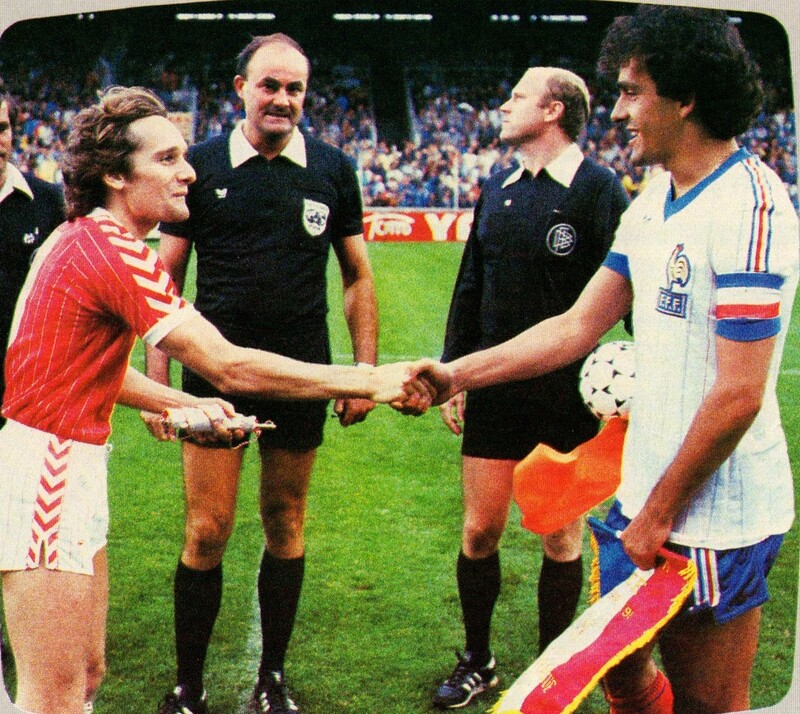 France’s final friendly of the season was against Belgium at Luxembourg to celebrate the 75th Anniversary of Luxembourg’s Football Association. Hidalgo would be forced to build a makeshift squad as many of his regulars were missing. Michel Platini was once again unavailable, as Juventus had retained him for the Coppa Italia. 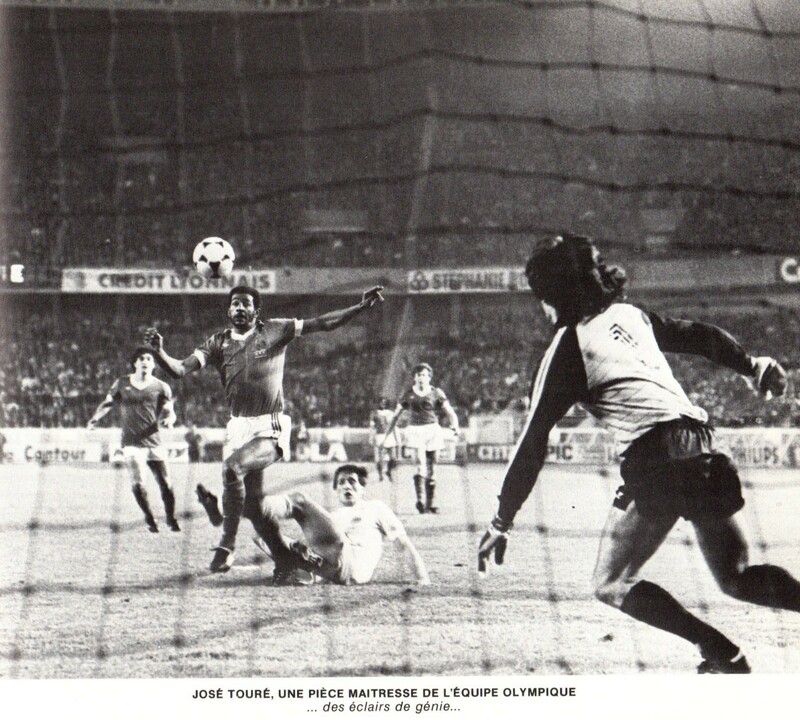 In Addition, Tresor, Bossis, Tusseau, Rocheteau, Ferreri, Bellone, Amisse, Giresse and Tigana were either injured or unavailable. Hidalgo had no choice but to call-up uncapped players and or recall others (mostly from the Olympics squad). Uncapped players: Phillpe Jeannol, Jean-Christophe Thouvenel, Jean-Claude Lemoult and Phillipe Vercruysse were called up, while striker Gerard Soler and Bernard Zenier earned a recall. Hidalgo said in an interview that he had even contemplated recalling Dominique Bathenay. In a 4-4-2 formation, Battiston was installed as the Libero with Le Roux as his central partner. Amoros retained his spot at the back, with Thouvenel making his debut as right back. Lemoult would start in midfield partnering his PSG teammate Fernandez. Lemoult was on the defensive midfielder on the right side assigned to counter Frankie Vercauteren’s surges. The Belgians themselves were missing goalkeeper Jean-Marie Pfaff and Jan Ceulemans. 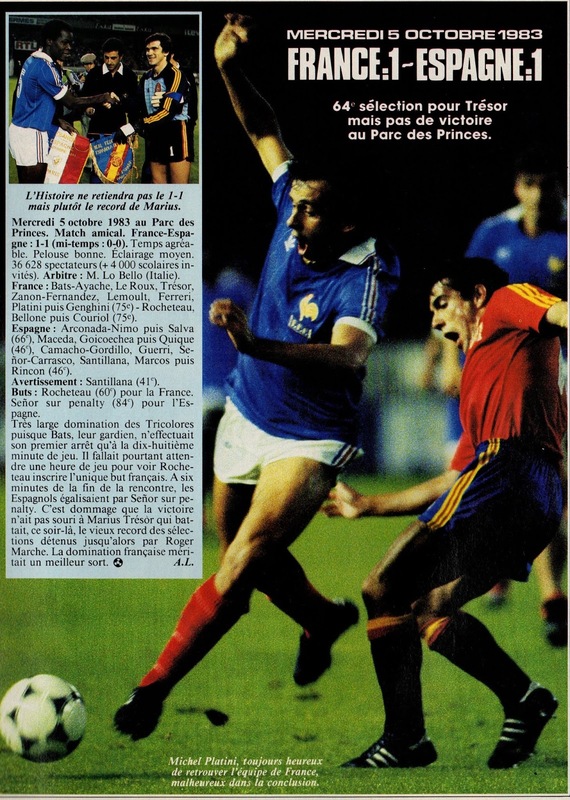 In the match, the French were generally better despite the eventual tie score. France scored through Didier Six after eleven minutes. Just a minute later, Voordeckers leveled the score. After the match Hidalgo felt that despite the absences the squad maintained its mentality and he was satisfied of that. 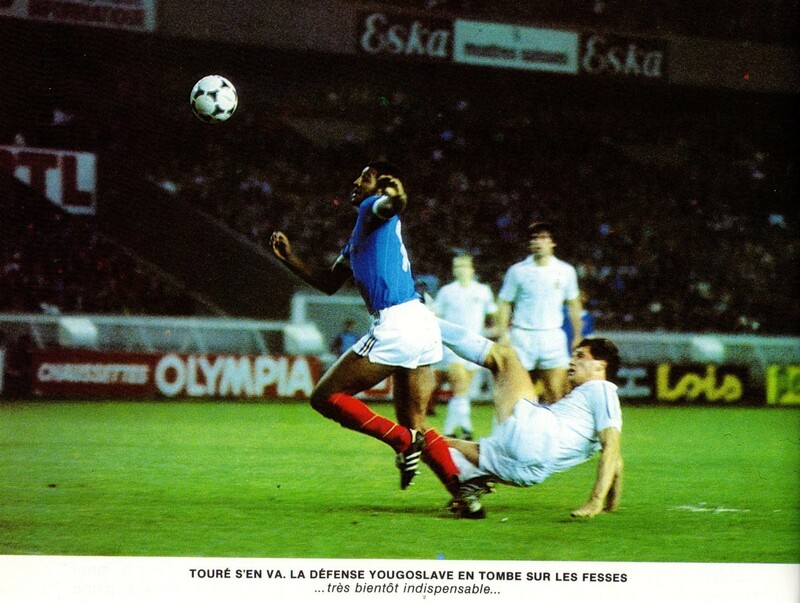 He also said Toure and Le Roux had once again confirmed the premise shown in the previous match vs. Yugoslavia. As far as the newcomers, Thouvenel did not seize his opportunity and struggled against Voordeckers. He would not play again under Hidalgo and would go back to the Olympics squad. Gerard Soler played his last match for France as well and was out of reckoning afterwards. Vercruysse and Zenier would likewise not return to the squad, same as the unused defender Phillipe Jeannol. Yannick Stopyra also played his last match under Hidalgo. He would be called up a few times in the following season but would not play. 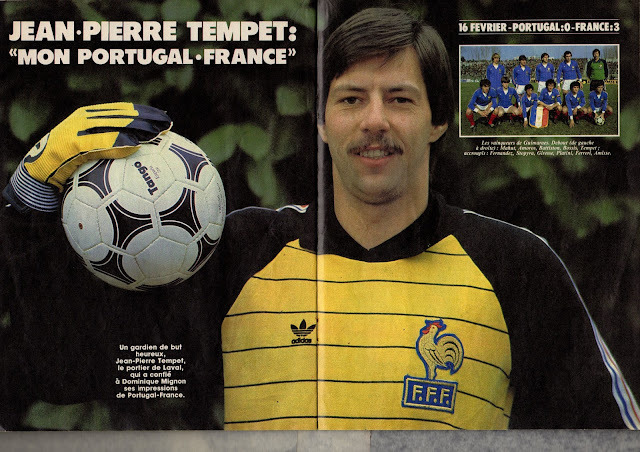 This also turned out to be the final appearance for Jean-Pierre Tempet, who appeared to have been Hidalgo’s choice as the starting goalkeeper at this point. The season came to a close and it was time to analyze the 35 players tested that season. The goalkeeping position was still up for grabs. In defense, Amoros and Battiston were set to be the outside back positions. Le Roux had broken through the squad and imposed himself as the Stopper. Bossis appeared to have the edge as Libero and it remained to be seen how Tresor would be handled in the season given his status. The midfield was the strongest element of the squad, with Platini, Giresse, Tigana and now Fernandez, with Genghini and Ferreri as alternatives. Ferreri had been one of the revelations of the season, but was still not experienced enough to dislodge the quartet, but was a hope for the upcoming years. It was upfront that France had many uncertainties, as no center forward had established himself. Hidalgo felt the left wing was covered with Bellone, Six and Amisse as options, but the right wing was problematic. He believed Ferreri might be able to occupy that role, as well as Daniel Bravo or even Alain Couriol. There were some positives aspects to the season. The team appeared to have been progressing since the World Cup. There had won matches away from home. The injection of youth (Ferreri, Fernandez, Le Roux, Toure) was praised all around. The unavailability of Platini for some matches (now that he had joined Juventus) was a cause for concern, but his time in Italy had made him an even better player and he was about to win his first Ballon d’Or. He managed to play in 3 out of 7 matches, but Hidalgo was insistent that he was desperately needed. Hidalgo stated that this first season was mostly for experimentation and to maintain the World Cup mentality. He expressed that in the upcoming Fall, the real hard work would begin to prepare for the Finals.